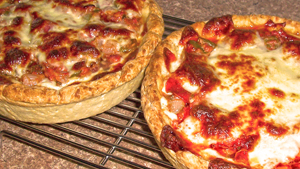 If you are going to be in Chicago soon, then stop in to Giordano’s on Rush St. for authentic deep-dish pizza. If you cannot make the trip, then try this. You need approximately $15.00 and about 3 hours. This puts the “pie” in pizza pie. You have to sit down to eat this 2 1/2″ tall crust with layers of cheese, pepperoni and sausage, tomatoes, more cheese, and more everything. You can make a spectacular 14″ or two 9″. I prefer the two 9″. You can make one pepperoni and the other sausage. The crust is unique. It is made with three different fats–olive oil, melted butter, vegetable oil–and also contains cornmeal for a subtle crunch. The filling is Mozzarella and Provolone cheese, sweet Italian sausage, pepperoni, (you can sub sautéed vegetables, but make sure they are very dry), canned diced tomatoes, garlic, sugar, pizza seasoning, and grated Romano. Do it right and you are in pizza heaven. Welcome to the Kitchen, Tom! I’m hungry just looking at the photos. Definitely suggest checking out the King Arthur link for their their Baker’s Banter blog, which includes excellent step-by-step photos and instructions.